Terragon Environmental Technologies Inc., a developer of waste-to-resource technology solutions, has entered into a strategic partnership with Green Marine Capital (GMC). Terragon CEO and Co-founder Dr. Panayotis Tsantrizos said the partnership will allow the company to commercialize its products in the marine sector. Terragon’s first commercially available product, the Micro Auto Gasification System (MAGS), is designed to convert each kilogram of organic waste generated by a habitat into 2kWh of thermal energy by using gasification technology the company says is clean and simple to operate. The technology was the winner of a recent award for Technical Innovation in North America. Currently, MAGS is commercially available in multiple market sectors, and has been used by the military and isolated communities in the Canadian Arctic. A second product, the Wastewater Electrochemical Treatment Technology (WETT), converts sewage into clean water. Tsantrizos said that WETT is currently in the field evaluation stage of development, but expressed hope that WETT will be commercially available in 2016. The company said the combination of the two technologies will be able to eliminate waste discharge from any habitat while reducing energy and water needs. Sverre Prytz, Managing Director of Oslo and Singapore-based Green Marine Capital, noted that regulatory changes in 2013 increased the importance of waste management technology onboard commercial vessels. 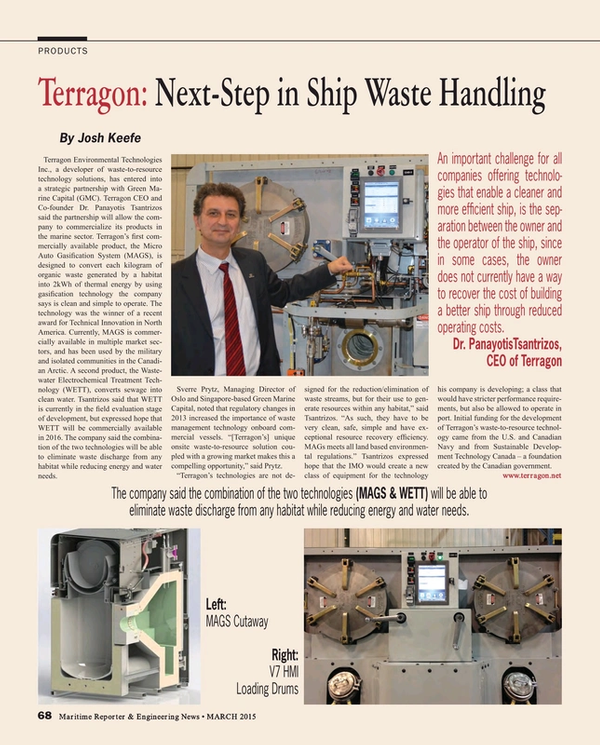 “[Terragon’s] unique onsite waste-to-resource solution coupled with a growing market makes this a compelling opportunity,” said Prytz. “Terragon’s technologies are not designed for the reduction/elimination of waste streams, but for their use to generate resources within any habitat,” said Tsantrizos. “As such, they have to be very clean, safe, simple and have exceptional resource recovery efficiency. MAGs meets all land based environmental regulations.” Tsantrizos expressed hope that the IMO would create a new class of equipment for the technology his company is developing; a class that would have stricter performance requirements, but also be allowed to operate in port. Initial funding for the development of Terragon’s waste-to-resource technology came from the U.S. and Canadian Navy and from Sustainable Development Technology Canada – a foundation created by the Canadian government.